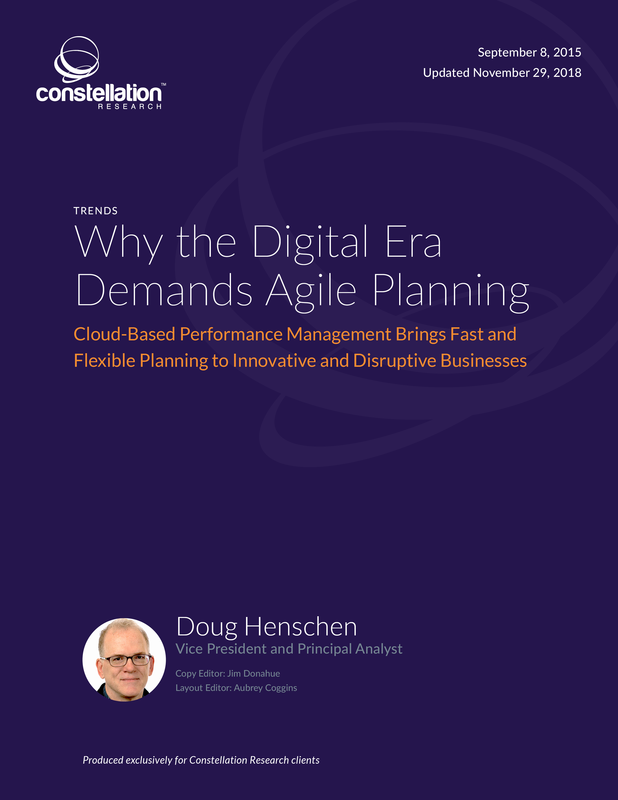 Why the Digital Era Demands Agile Planning | Constellation Research Inc. These are disruptive times. Companies not busy innovating are likely doing their best to fend off new competitors. When they’re trying to innovate or respond to change, they need visibility into business conditions and solid planning and forecasting. They need what-if analysis to test new business models and gauge the impact of new products and services. In this environment, old-school spreadsheet-based financial planning and analysis can’t cut it anymore. Yet that’s what many businesses are stuck with. Corporate performance management (CPM) systems (also known as enterprise performance management systems) introduce powerful budgeting, planning and forecasting capabilities that bring consistency, traceability and more reliable data to budgeting, planning and forecasting. Unfortunately, the legacy, on-premises CPM systems that still dominate the market—from Oracle, SAP and IBM—never really succeeded in being broadly adopted. They’re largely used only in the office of finance because, as customers widely report, they were difficult and expensive to deploy, hard to use and difficult to change as business needs change. Enter cloud-based CPM, which started seeing adoption by small and midsized businesses more than a decade ago. They’re now gaining adoption by large enterprises—following in the footsteps of other software categories—on the strength of rapid deployment, low initial cost and minimal IT overhead compared with on-premises options. Cloud-based CPM systems also have a reputation for being easy to configure, change and administer, and they’re intuitive and easy to use for business users seeking budgeting, planning, forecasting, analysis and reporting capabilities. This report explores the features and functions of cloud-based CPM, including budgeting, planning, forecasting, modeling, analysis, reporting, financial consolidation and regulatory reporting. Constellation also explores the vendor’s target customer, industry specialization, geographic reach and pricing models. This paper provides insights into CPM in the context of three Constellation business themes: Data to Decisions, Future of Work, and Technology Optimization and Innovation.